While reading Saturday's Union newspaper, we noticed a familiar picture listed in the Real Estate section that was holding an open house for potential buyers. Maybe it would be fun to revisit the beginning of our marriage where we lived, for eight years. During this period, four of our children were born. Realtor John Brady showed us around. Margie, Tim and Sue showed up and all of us were overwhelmed by the nostalgia of old memories of this old place that was so conveniently close to everything. Mel's parents owned the place when we lived here in the middle apartment. 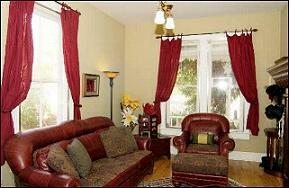 Since then it has been nicely remodeled back into a home with only one apartment located downstairs. 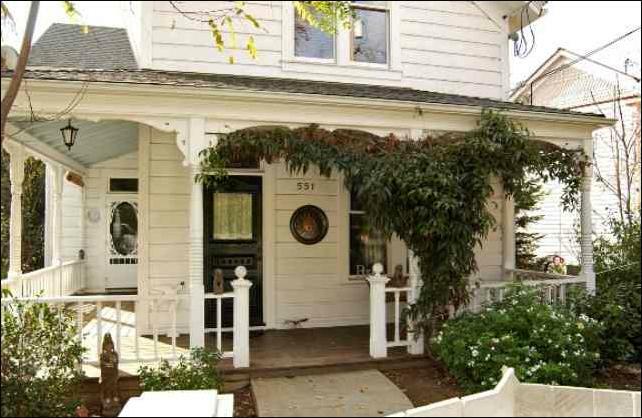 It's a little smaller than when sister Kathy's family lived there. A stairway from upstairs leads down into a little workroom that opens out into the back yard (below). There wasn't much of a yard when we lived there. We made a small lawn and Mel built a platform for our children's little swim pool in the summer. 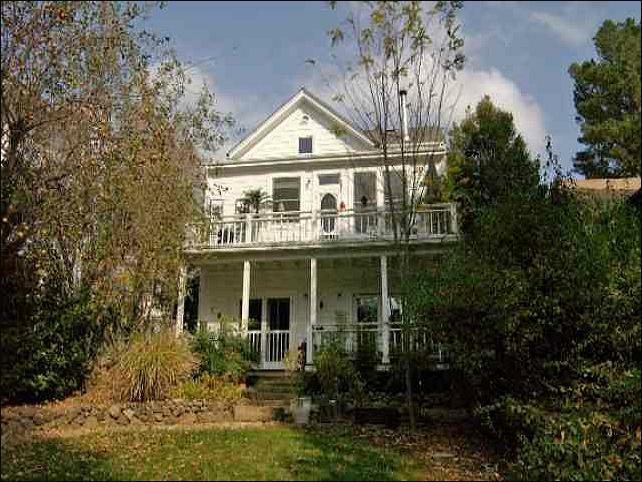 This is the rear view of the place. It's interesting how creative the new owners were. There was a full size porch upstairs mostly closed in...with a clothes line that went to a tree in the back yard. There wasn't much of a porch downstairs, but rather a little cement landing. 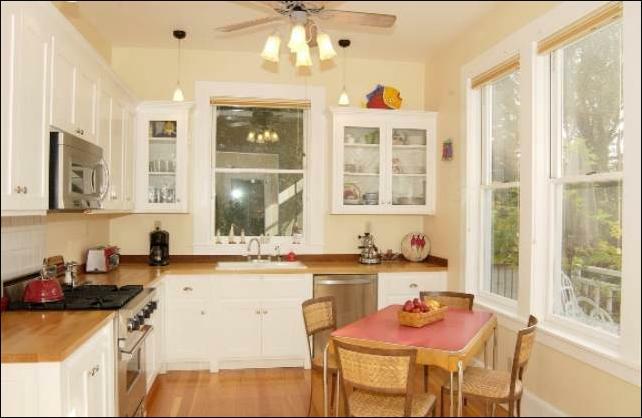 The kitchen looks out to the back deck. 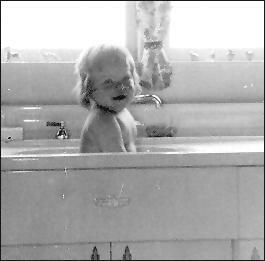 In the above photos, little Margie's sitting in the former apartment kitchen sink, and playing out front where Mel's Harley is parked. These photos were taken in 1954. She was born in 1953. 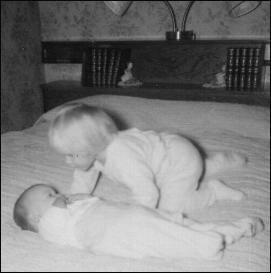 Margie was delighted when her sister Cheryl (right) came into the world in 1955. She spent a lot of time carefully pushing her in a baby stroller. She'd also sit by her with a book, point to the pictures and say what the picture was. One day Cheryl was sitting on the front porch in her jumper chair. A lady carrying a large bag of groceries was walking by. Cheryl surprised everyone by asking her, "What you got there?" She started talking in short sentences. Margie says she loved living there because it was so close to the Elementary School. The alley to the back of the school was across the street from us. Sue adds that "I was watching Margie and Cheryl walking off to school and I really wanted to go too, but we moved when I was 4, so I never did get to walk. 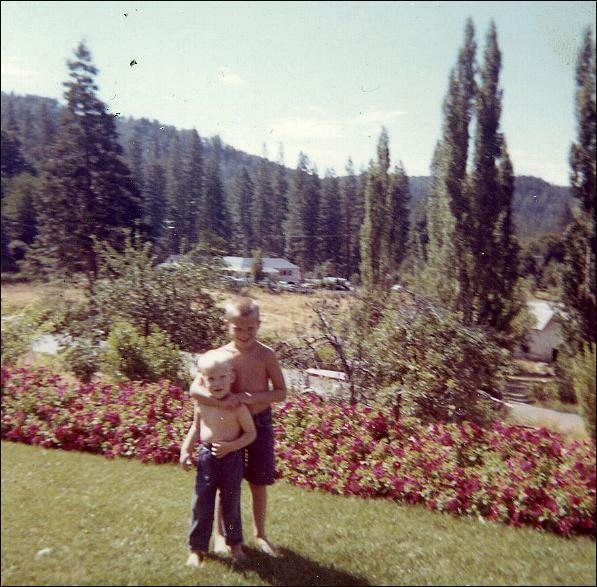 I also remember playing in the yard around the paths alongside the house." 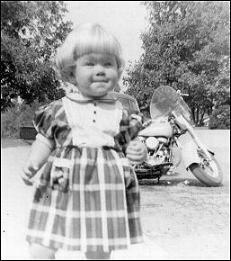 The picture above-right was taken in 1955 not long after Cheryl was born. Their bedroom was in the next room. Susan was born in 1957, and Mike in 1960. He would rock back and forth in his crib before going to sleep, and when I told him to stop it, Cheryl protested that the sound helped her go to sleep. 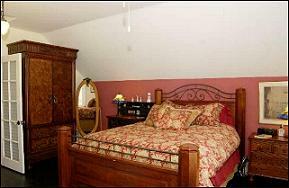 Their bedroom was to the right of the stairway (below) where the living room is now. The stairs lead to an upstairs bedroom (bottom left) that used to be an apartment. 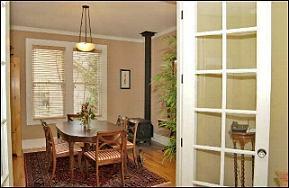 The hallway door opens into the dining room that was our living room. Our bedroom was between theirs and the bathroom. We had some wonderful neighbors. The Keefers on the lower side, Mr. and Mrs. Hypes above us, and Mr. and Mrs. Penrose across the street. The Hypes were quite elderly, and she used to complain that she thought her husband turned his hearing aid down rather than listen to her. She smoked cigarettes, and once brought over some green beans she'd cooked. They had a slightly burnt flavor, and I imagined her stirring them with a long burnt cigarette ash extending over the pot. Kathy and I attended school with the Penrose boys, and as a teenager, Mel drove a grocery delivery truck for their family. The Keefers were very busy, talented people. 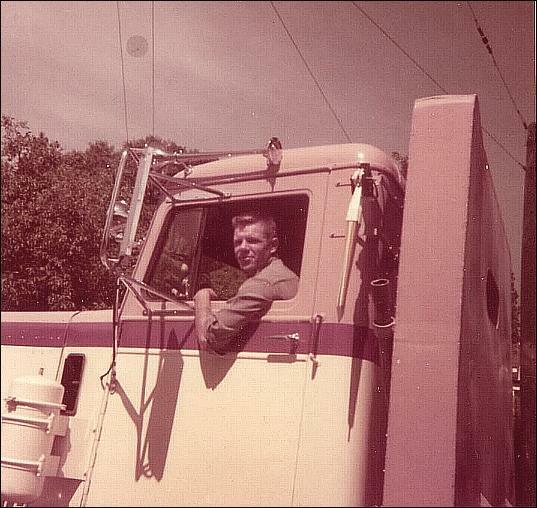 While we lived on Pine Street Mel bought an old GI truck, that he later replaced with a Peterbuilt (above 1956 photos) to haul logs with. Sometimes he'd park it across the street, until Police Chief J. Jackson said he couldn't park there anymore, because it would be too hard for the fire truck to get through. Mel joked, "Tell him to let me know, and I'll drive it through." He parked over the hill beside Broad Street after that. 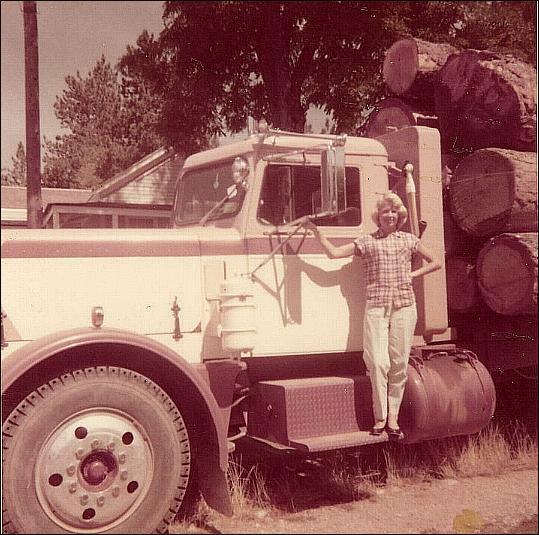 Loggers didn't work in the winter months, so Mel would haul cars, produce, or freight throughout the states to earn a living. He liked hauling logs best, because he was home. Springtime was always very insecure, because of the weather. 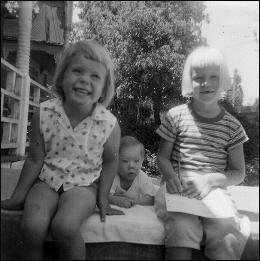 This photo (above) of the four little munchkins was taken in 1960, not long after Mike was born. 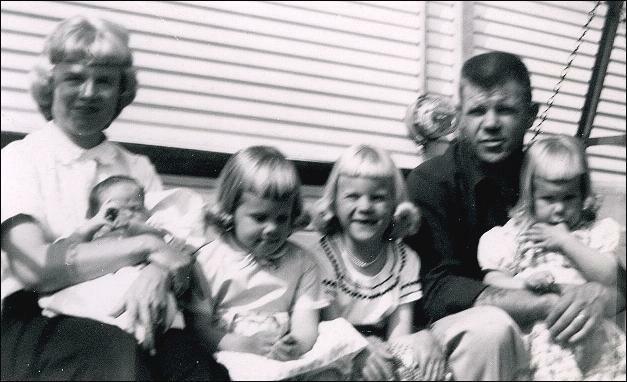 From left to right I'm holding baby Mike, then Cheryl, Margie, Sue and Mel. We were visiting Mel's parents on Red Dog Road. The children used to love visiting and staying with their Nanny and Papa, and before long we were able to build our first house next door to theirs. 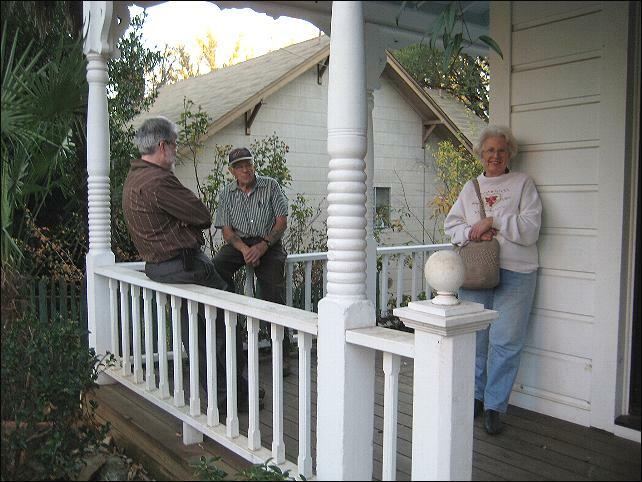 At right are Cheryl, baby Mike and Margie enjoying themselves in front of our Pine Street apartment. During this period, we heard about Wilmer Homes building affordable homes in our area. They had some basic models ready to build and finance. All you had to do was pick the one you wanted, and have good enough credit to finance it. There wasn't much expense with the County planning then. I went to the planner to ask a question. He put his finger to his lips and told me to speak softly. He only wanted to make sure the water, sewage, electrical and propane were safe, and wasn't interested in un-necessary stuff. We moved into our new home in 1961. Kirk was born in 1963. Mike seemed a little awed when he first saw his little baby brother. 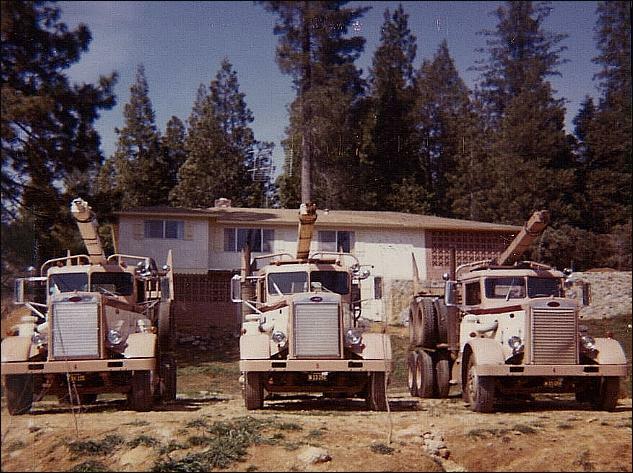 Our log trucks parked in front during 1964. Mike and Kirk a few years later. Interesting how re-visiting our first home could open up so many memories like this one from Ken Kinder. There are more, but I'm going to stop here.